ALBERT sounded like an out-of-tune, jazz version of “A Charlie Brown Christmas.” I couldn’t erase the mental image of Snoopy dancing on top the piano. The next two songs had me thinking this Ray Jozwiak was the love child of Linus and Mary Lou Retton. I could visualize the tumbling runs as Linus pounds out the goofy dance beats the athletes must writhe to. It wasn’t until track four, MONEY, that I finally got it. Ray brought in some funky bass that changed the cold striking of the keys into smooth, honey-fingered piano jazz. The rest of the CD was an effortless listen. Jozwiak is talented and needs to be heard. Ray is an incredible pianist showing a unique and cutting edge jazz style in spades. Although very difficult to pigeon-hole and self-admittedly unique to any genre, his style is at once esoteric yet melodic and demands the listener to really pay attention. His writing takes you on jazz journeys that take you to places you never expected to go and make Ray an interesting listen. I like to call this “Brandy Music”, cause it goes so well with a snifter in hand. This may very well be the first and only time I will have the opportunity to review a pianist, but thankfully Ray Jozwiak is the candidate. His collection of free-jazz style life-inspired instrumentals dubbed Critic's Choice, successfully draws nostalgia, hope and even a smile from listeners. Jozwak's strong point, of course in addition to impressive technical ability, proves to be a drifting hand with a strong command over improvisation. With literal and emotional ups and downs, he coasts easily throughout the proverbial hills. "Epilog," after many listens, remains a sheer data packet of proof for Jozwiak's skills, as it scavenges from the darkest under-bed sites to the highest pillars of light for instrumental influence while still managing to tweak in a few lines of pure rhythm to keep you hooked. Overall his form is superb. Check out this new twist to the indie-jam scene. Named BALTIMORE'S BEST LOUNGE PIANIST 2005 by Baltimore Magazine, Ray Jozwiak is much more than that. Ray's sophomore release CRITIC'S CHOICE further expands his musical palette, featuring several full-ensemble recordings and one vocal, in addition to the requisite solo piano forays. Accessible yet stimulating original compositions with generous amounts of piano improvisation. "Magic that I thought was gone forever returns!" 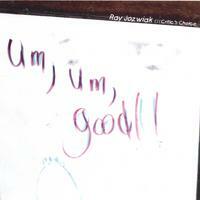 "Um, um good!" is an apt title for Ray Jozwiak's latest release. Love they way he weaves the stuff of his life (namely his family) through the fabric of both the music and the packaging. I do wish he sang more though; the one selection that features his "jazzy" vocals reminds me of Edgar Winter's "Entrance" which has long been one of my faves. The good news is that it is a lengthy piece, easily covering the time span of 2 or 3 more conventially timed tunes. Orchids, Ray!! !